Given we have now, over the past three months, seen the market do just that, it was probably time for an update on what I currently see in the market. Before I start, I want to stress that all of what I write is my personal opinion and not my professional opinion. None of what I write is financial or legal advice. Bitcoin prices, just like any other asset can go to zero or rise in exceptionally fast fashion and I am probably wrong 50% of the time. Do your own research. 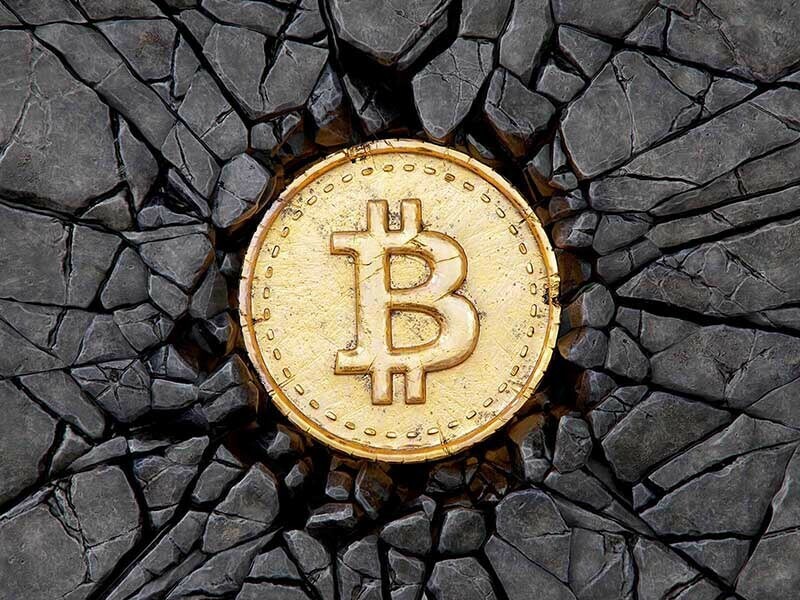 After bitcoin took the (not entirely unexpected) plunge from the $6,000 area down to $4,000, its price began a consolidation period that has lasted for three months now. As you will remember from my previous posts, charts are not super important to me, I just like to use them as an additional data point as I do believe people behave similarly in similar situations. 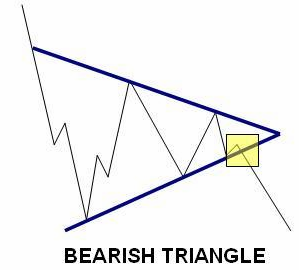 That being said, for those of you who believe in charts per se, I think looking at the above, the Bearish Symmetrical Triangle forming currently is reasonably obvious. You can see the “book” version of it on the left. Theory would suggest that this has a higher chance to break down than to break up. In any case, to trade this, most successful traders would wait for a break and confirmation. So the chart does not scream “action” to me right now. What is much more important to me than the chart, though it is hard to gauge, is general market sentiment. My most successful trades have always happened when the majority was positioned for the opposite to happen or when I was able to recognize a trade about to get “super crowded” before it did. I have been vocal on both opportunities in bitcoin (the way up, as well as the way down). So what does sentiment look like? Sentiment is, as I stated above, notoriously hard to measure. It is even more difficult because you have your own sentiment (your fear and greed monkey, see this) to deal with as well. There are numerous measures of sentiment of course, but the best one I know is the actual positioning of traders. If there is data available, the advantage is that this is not what people answer in a poll (where they can lie), but where they put their money. In crypto, there are three sources of “real” data in this respect. All of them have their issues. Firstly, there is the Bitfinex data on traders positions using margin. They detail both the current long positions (which means the amount of bitcoin that are currently being held long and traded on margin; ie someone is putting down, say 5 btc but buys 25 btc. Once the price falls 20% his 5 btc “collateral” is eaten up, so his position gets liquidated), as well as short positions, which can be combined into a ratio. Bitmex’s perpetual futures on BTC and ETH are financed by the respective traders paying a financing cost. This is used as an incentive to ensure the Bitmex Future price is always close to the current cash price of bitcoin on Coinbase and Bitstamp. So when the price deviates much to the upside vs its cash-based references, financing will be borne by longs. Disadvantage: due to the construction of the financing costs (it being price based vs a cash market as opposed to driven by actual position sizes), it is an imperfect indicator of sentiment. You could say it is a derivative of market sentiment, but not sentiment itself. Bitmex lists bitcoin futures for every three month period with typically the next two dates listed. In futures markets, when people expect the asset to increase in price, dates further away from spot will trade higher vs the current market price. This situation is called “contango” and it means that when you “roll” a future (ie sell the current one for the next period; sell March for June), you have to add collateral (ie you lose money). An example works best: if you have 1 bitcoin future for March and you want to roll it into June, but the March price is $3,700 and the June price is $3,750 then to keep your position you need to add $50 to your trade. You would obviously only do that if you expect bitcoin prices to rise more than $50 over the next three months. The opposite situation is called “backwardation”. Contango indicates that traders are Bullishly positioned, Backwardation means they are Bearish. Disadvantages: Again, in my experience, this moves slower and might be more relevant to weeks/months in holding periods, but less for shorter holding periods. I am saying you could be totally correct regarding sentiment using this indicator but still lose your position due to the short term fluctuations being huge and liquidating you. a) Bitfinex Long/Short Ratio: the ratio itself is not as extended as it was during the bubble days, but the Longs are near an all-time high and the shorts are quite low. In fact, this indicator has not been as Bullish since Jan 2018, translating to Bearish for contrarians like myself. 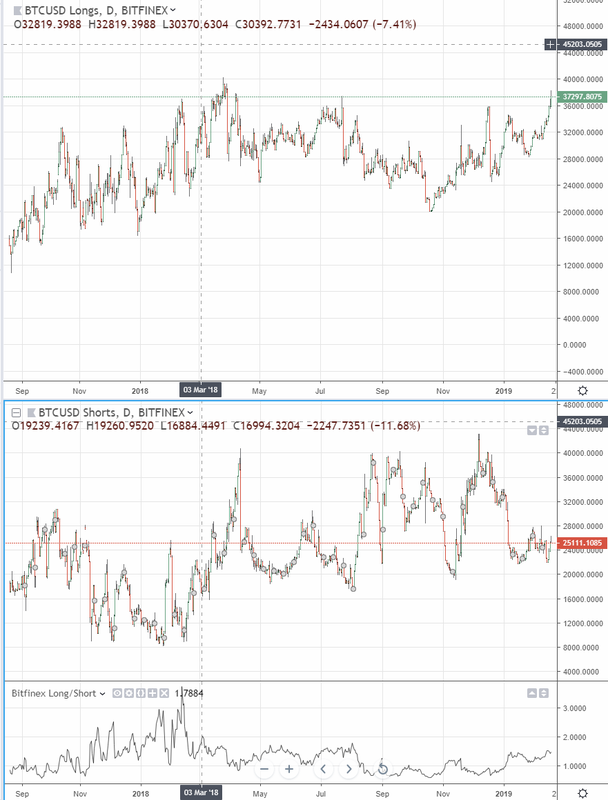 b) Funding rates: They are currently fluctuating, but in general, ETH long traders had to pay short traders quite substantially recently (now it is no longer the case), while BTC was cheaper to be long. As at this time, I’d say it is neutral. c) Future Chain: The future chain has been in backwardation since $6,000 fell. Over the last week it has crept back into contango / neutral. That means this indicator is also currently neutral (but has gone back from very Bearish to this status). In the past contango and backwardation reached $100–150 at times, so anything where it is now is not really much. Overall, these indicators tell me sentiment is neutral medium term and quite Bullish short term (which translates to Bearish as an indicator if you believe the majority is wrong). This does not change my personal neutral stance. I believe that the tether project is unlawful and I believe that over time, law enforcement will act. The problem is, that usually takes much, much longer than you’d expect, especially in a tricky case like tether. While tether is still a huge amount of crypto trading and there are $2bn+ in existence, this is a substantial tail-risk to any long position. Along the same line as the tether paragraph above, it is reasonably obvious to any observer that the above exchanges are not exactly “friends” of regulation. They have either engaged in domicile hopping to escape regulators or in some cases openly mocked these. If there were a legitimate concern that bitcoin is used for money laundering or tax evasion, the respective authorities will find a way to shut down these hubs. I am not saying that is the case, but I do think it is another significant tail risk to crypto prices to see one of these just disappear. Specifically over the period I highlighted on the left, something “felt” different to before with regards to volume and the “quality” of the most recent pump. Yes, the pump was still lead by tether et al, but the exchange traded volume was actually very high and convincing. More importantly, volume has stayed high over the highlighted period (vs the months before). 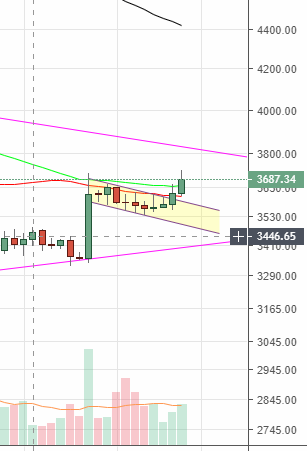 There was no massive “follow through” on the move up and the period is too short to jump to conclusions, but the recent move up from $3,300 to $3,700 felt much “healthier” and sustainable than the pumps before. When I say that (which sounds like a personal observation rather than an actual data-based observation), what I mean is that the price has jumped, but it did not just jump out of nowhere in a 15 minute candle that blew through everything, but rather price had to fight for each subsequent level on the hourly and daily this time. That means it is less likely to be just one manipulating entity (cough… tether… cough) but broader based buying. It might still have been driven by tether, but it seems less likely it is just one decision-maker. This would change immediately if we “bart” down from here. A key to this market getting healthier and a bottom forming is that prices climb up over time and that “barts” become less and less likely. Markets generally like to climb the wall of worries. There is typically a “pain trade” to the upside when people are concerned with something like tether long term, bitcoin just being a useless database, an ETF not coming long-term as well as a major fork (constantinople in ETH) being postponed. Actually, these fear-driving issues hang over the price and mean people are often not fully exposed to a move up. That could provide some fuel if any of these issues is lifted or looks like it could be soon. China un-banning bitcoin would be an additional bonus. This is a soft indicator, but the number of reads for my articles around crypto, the anger displayed by most crypto tweeps on twitter as well as the fact that many of the full-time crypto chart bloggers on Twitter have moved to maybe 50–60% crypto charts and are now talking about equities, stock indexes and FX as well shows you that the hype is over. That is a good sign. I have frequently stated that in order for the market to bottom, the early crypto accounts (“OGs”) need to feel the pain. I am not sure this has been the case yet and would be more comfortable if bitcoin dropped to $1,000. However, a few people in the industry have told me some stories that suggest the pain may have been enough. I am unsure about this one. I have said numerous times that security token without security rights have an intrinsic value of zero. Too many of those are still around for this to be the long-term bottom. These additional observations are certainly not exhaustive. I am more than likely to have missed some. Let me repeat again, that all of what I write is not investment advice and it is also just my personal opinion. I can be wrong. Don’t trade on this, but maybe you can build your own tool set to trade and some of these indicators can be useful to you. My read on the current situation is that we are seeing a consolidation of the $6,000 break that I expected in my last article. As of this moment the consolidation is not complete. 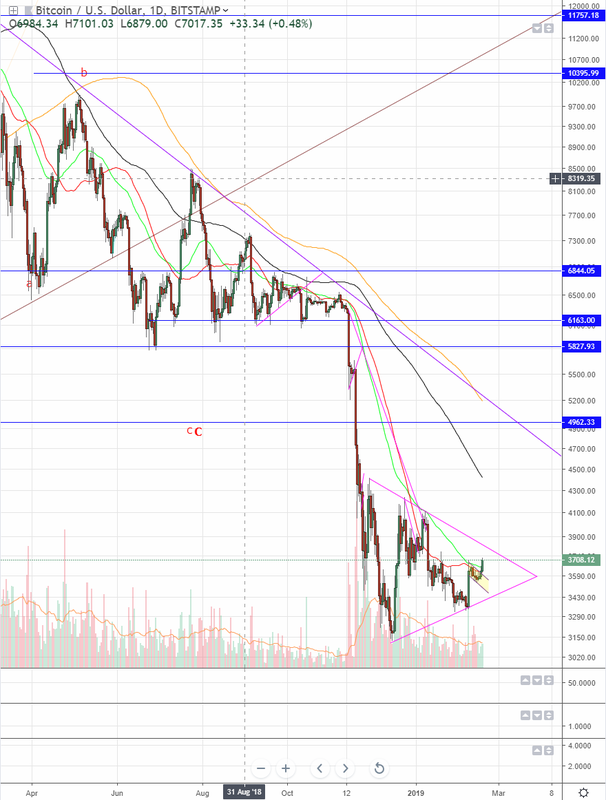 A break out from the above mentioned symmetrical triangle should give a good indication of the near term direction, but only upon confirmation of such a move (no need to FOMO when it happens). This could be the bottom, but there is just as much fuel that would allow prices to tank again after this consolidation. As for now, given the clear improvements regarding a long-term bottom, I remain neutral, but I am cautiously optimistic that bitcoin will indeed bottom around here. In any case, I would expect rallies and sell-offs of similar strength to produce further sideways movement. You could see the price of bitcoin stage a somewhat impressive rally once the short-term optimism is washed out, but there are still too many roadblocks in my view for the FOMO to return. Or rather, if it returns today, it is likely to just lead to the next bust down the road. I should probably add – if we break the symmetrical triangle and get confirmation that opens the door for a larger bear market rally. It does not mean that we won‘t see a lower low after that rally. I believe we are zero to one large capitulations away from a long-term bottom and will keep tracking all the above indicators personally. You should be able to do so yourself if you like.